The band announces they will be performing their new EP in full on the City Life Manchester stage at the Manchester Food & Drink Festival on 4th Oct, Albert Square, 8pm. White announces McGregor and Nurmagomedov will fight in UFC 229, in Las Vegas on October 6. I wouldn’t say this is a crossroads fight. This is a very important fight for both fighters. For Khabib, who is undefeated and who is looked at as one of the best fighters in the world, beating Conor is massive for him. And obviously for Conor, coming back from a two-year layoff, in my opinion — and it’s crazy to say this because of how popular he is around the world — but he’s one of the most underrated fighters in the UFC. Everybody thinks because he speaks so well and gets so crazy and everything, it makes him sort of less of a fighter. It’s the weirdest thing I’ve ever seen…When you talk about pound-for-pound, best in the world? This is a guy who is actually living proof for pound-for-pound. He [McGregor] jumps from weight class to weight class and fights people in different weight classes. 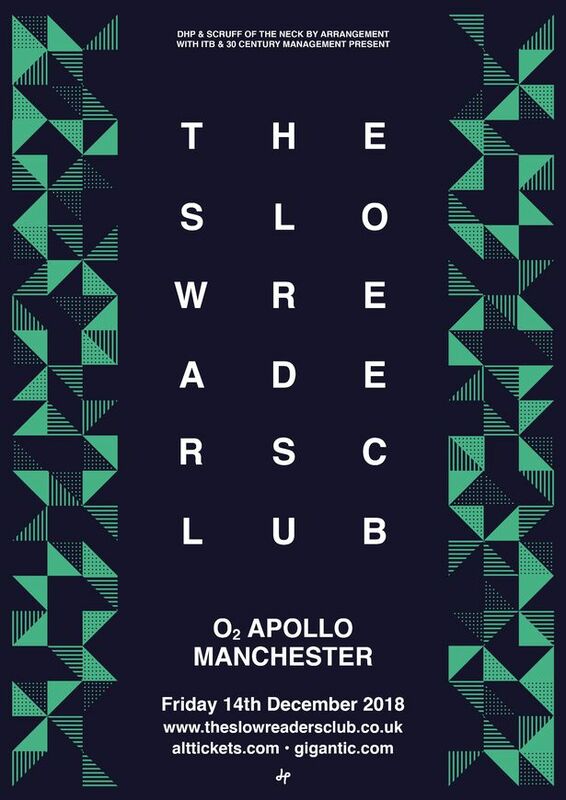 The band announces a five-day headline tour of the UK and Ireland. Nurmagomedov’s team says their fighter will fight McGregor on October 6 at the T-Mobile Arena in Las Vegas. ⚡️BREAKING: @TeamKhabib vs. @TheNotoriousMMA in the works for UFC 229 October 6, Las Vegas, T-Mobile Arena. I’m not ready to fight yet. I need to wait until all the symptoms of my ulcer stop. It’s much better than it was but it’s not 100 percent yet. If I try to return for a training camp for a fight it will amplify and go back to what it was in the beginning. I need to get over this first for my own health and safety. The Nurmagomedov-McGregor bout is impacted by McGregor’s legal issues. However, Nurmagomedov’s camp has also been pushing for a match up with St-Pierre instead, which they call a “legacy” bout. After he was not able to meet with McGregor in Liverpool, White says the meeting has been rescheduled to Las Vegas, and that he is planning for the Irishman to fight Nurmagomedov. He also says he has not seen McGregor since the incident in Brooklyn and that he is not involved in his legal defence in any way. Conor and I are going to meet in Las Vegas,. I’m pretty confident [a lightweight title fight] is a fight that Conor wants, and I’m pretty confident that is a fight Khabib wants. So yeah, I could see that happening. White says he and McGregor will meet in Liverpool in the coming weekend to discuss the fighter’s future. We’re going to sit down and talk about his future and what’s next…Obviously, he has to deal with [his legal situation] in June. I’m flying to Liverpool this weekend for a fight there, and he and I are going to meet in Liverpool. The world premiere will be on November 1 in Dublin and Conor will be there and some other big names. It’s going to be a big red-carpet event. Conor really wanted the premiere to be in his hometown. The film will debut here and be released worldwide throughout November…There were times when Conor would tell all the cameras to leave but then say ‘You guys can stay’. We were pretty invasive but Conor was really comfortable with us. Conor has told them that only the ‘Is’ have to be dotted and the ‘Ts’ crossed for this to go ahead. Conor’s not short of a few bob. There’s no bigger name right now, and he’s in demand across the globe, but the truth is he was really keen to come to Scotland. He loves his Scots fans and really wanted to thank them personally. It had been agreed in principal before the negotiations even started. Conor McGregorDemi LovatoFloyd Mayweather Jr.
Showtime announces it has signed Lovato to sing the U.S. National Anthem ahead of the McGregor-Mayweather fight. Lovato is a regular at UFC fights, and trains in MMA at Jay Glazer’s gym in Los Angeles. TMZ reports that a long list of celebrities will attend the McGregor-Mayweather fight on August 26, including Angelina Jolie, Drake, Elon Musk, Diddy, Mark Wahlberg, Denzel Washington, Charlize Theron, LL Cool J, Jamie Foxx, LeBron James, Bob Kraft, Rick Ross, Adam Levine, Michael Bay, Avicii, and Jeff Beacher. Others have yet to announce their attendance. White announces Ferguson and Lee will square off for the UFC interim lightweight title at October’s UFC 216 event for October 7 in Las Vegas. Kahbib’s not ready. It is what it is. This is a fight I have wanted ever since Badou Jack moved to light heavyweight and I’m delighted to fight in Vegas on an event like this. To be a part of this event and fighting on this card is historic. Nothing beats it. I’m excited to get back in the ring. I’m getting ready to take that belt, and win a title in my second weight class. In an IBF junior lightweight title matchup, undefeated Gervonta Davis defends his belt against Costa Rica’s Francisco Fonseca. A 10-round cruiserweight bout, between Chicago’s Andrew Tabiti and Philadelphia’s Steve Cunningham, is also announced. Hardy, a former UFC welterweight contender, is named by Sky Sports as part of the UK and Ireland commentating team for the McGregor-Mayweather bout. This will be the first boxing match that I’ve worked on. Obviously I’ve worked a lot with boxers in the past. I’ve trained alongside boxers because back in the day with mixed martial arts, they were the only real combat athletes around me that knew what they were doing. As soon as it becomes a mixed martial arts fight, (boxers) become interested. There have been questions that have come from (boxers) in the past that will prepare me for this, I think. I understand the boxing mentality and I understand what they’re going to be looking at as far as Conor McGregor as a new addition to the sport. McGregor announces an after party at Encore Beach Club in Las Vegas, to take place after his fight with Mayweather. This is surely one of the most anticipated and intriguing contests we’ve ever seen on Sky Sports Box Office. Can the charismatic Conor McGregor, so formidable in the octagon, make the switch to the ring and create history? What will it mean for Mayweather’s legacy – one of the greatest fighters of all time but coming out of retirement and facing a man at the very top of his game? It’s set to be a huge night in Las Vegas – one you won’t want to miss. In an echo of the McGregor-Mayweather fight, two dwarves are set to fight in Las Vegas’ Hustler Club, on August 5. It’s rumoured that the fight will last a total of 3 rounds and ‘Mini Mayweather’ is currently the favourite as he previously fought Mini Pacquiao. Conor McGregorFathom EventsFloyd Mayweather Jr. The buzz that my fight against Conor McGregor is getting has been great already, so what better way to watch this larger than life event than on the big screen? We brought boxing back to movie theaters eight years ago and it was a huge success, but this event is on a different level and I’m so glad we are giving fans another way to see all the action. Grab your popcorn because this is a fight no one will want to miss. Hearn, Joshua’s promoter, says he is working to set a date for Joshua to fight Klitschko on November 11, in Las Vegas. While Klitschko has yet to trigger the rematch clause in his contract, Hearn believes he wants the chance for a final fight in Las Vegas. I’ve been in Vegas with AJ, officially applying for my Nevada boxing licence to promote there and that went well. I met with the MGM and met with the T-Mobile Arena. Vegas is the front-runner and November 11 is the date that is penciled in. It will probably take a couple of weeks to get everything over the line, but I believe Klitschko will take this fight and believe Vegas will be the one. AJ has been over there for about 10 days and has enjoyed himself and got to know the area a little bit. With the amount of British fight fans that would travel there, it will be a momentous occasion and one that we will savour for a long time, so fingers crossed it’s a party in Las Vegas on November 11. Tickets for the McGregor-Mayweather fight go on sale at 6 PM BST (1 pm ET and 10 AM PT) and can be purchased through this link here. In an attempt to stop touts from snapping up multiple tickets, only two seats can be purchased per transaction. The cheapest ticket will cost £385 ($500). Those wanting a front-row seat will have to fork out £7706 ($10,000). Fans who miss out on the initial sale will be able to purchase tickets via licensed third party resale websites. Conor McGregorEddie AlvarezFloyd Mayweather Jr.
Alvarez says that he watched all four of the stops on the McGregor-Mayweather world press tour and has booked a front row ticket to the August 26th clash. I love fights and when they have this much build-up around them. I’m going to the fight – I’ll be there, front row. A buddy, who sold me his house, got me front row seats. We’ll be there. Conor has about three or four rounds to get this done. Within those [first] four rounds, if you don’t think Conor can knock this guy out, you’re an idiot or you just don’t know fighting because it can very well happen. I never really get annoyed with [that UFC 205 loss] myself. I’ve dealt with it, forgave myself for it and I have moved on. Tickets for the McGregor Mayweather fight will go on sale Monday, July 24 at 1 p.m. ET/10 a.m. PT. To reduce the impact of bots and scalpers, the tickets will be sold through the Ticketmaster Verified Fan program which gives registered fans a unique offer code and link to use when purchasing tickets. Only fans who receive a unique code will have the chance to purchase tickets on a first-come, first-served basis, limited to two tickets per offer code. Registration closes on Thursday, July 20 at 10 p.m. PT. Leonard Ellerbe, CEO of Mayweather Promotions. 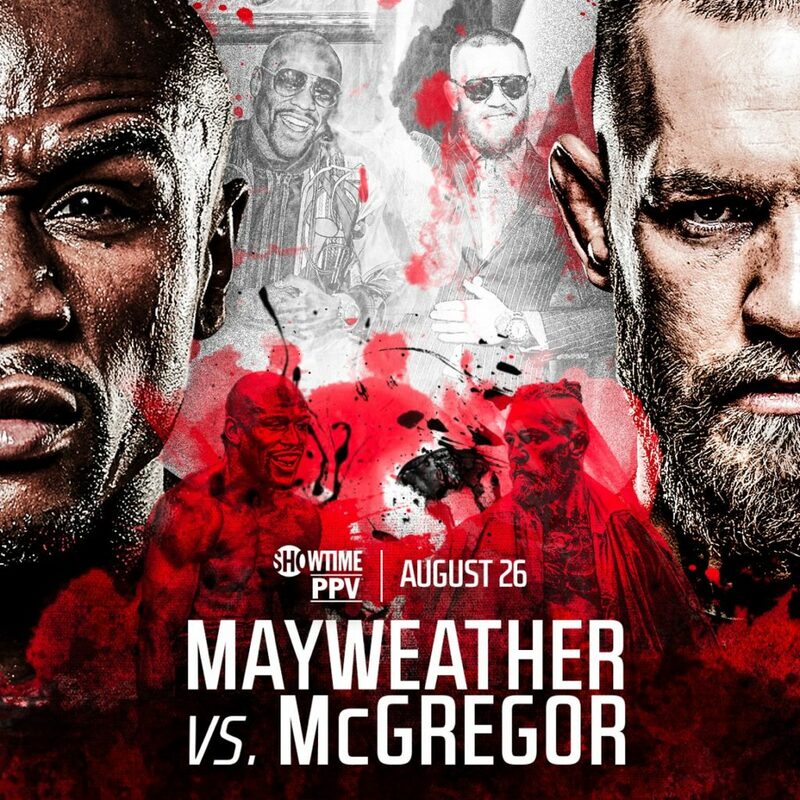 It is vital that we provide our fans with a fair opportunity to purchase tickets to this unprecedented event taking place on August 26 between Floyd Mayweather and Conor McGregor. This is a fight derived from the fans and should be available to be enjoyed by fans. It was necessary for us to partner with Ticketmaster Verified Fan for an event at this magnitude to provide everyone with a safe worry-free method to purchase tickets. a closer look at the build-up ahead of the blockbuster bout between UFC star Conor McGregor and legendary boxer Floyd Mayweather, featuring interviews and analysis. McGregor and Mayweather will appear on a livestream from Barclays Center in Brooklyn, NY. The show starts 11.30 pm (GMT) 7.30 pm (ET), and 4.30pm (PT). McGregor and Mayweather will appear on a livestream from Budweiser Stage, Toronto, Canada. The show starts 10.30 pm (GMT) 6.30 pm (ET), and 3.30pm (PT). Many fans are left frustrated after trying unsuccessfully to get tickets to McGregor-Mayweather London press conference. The event, to be held in the SSE Arena Wembley on Friday, July 14, will be the final day of their world press tour. Tickets, which were free and open to the public from noon on Tuesday, were limited to four per person on a first-come, first-served basis, but they were snapped up in seconds. Showtime announces the price for Pay-Per-View access to watch McGregor fight Mayweather will be $99.95 for high definition, and $89.95 for standard definition. The price is almost the same as the Mayweather-Pacquiao fight. The @FloydMayweather @TheNotoriousMMA pay per view price will be $89.95 — same as the Pacquiao fight – $10 more for HD. 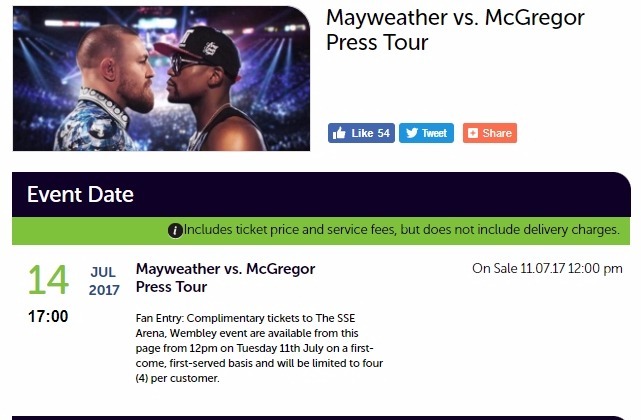 Tickets will be on sale for the McGregor-Mayweather Press Tour event at the SSE Arena at Wembley, London, from June 11 at 12pm (noon). Tickets will be available online at this link. Tickets are free, but limited to a maximum of four per person. The event will take pace on July 14 at 5pm. Davis confirms he will fight in the co-main event as part of the McGregor-Mayweather bout in August. His opponent has not been named. I’m the co-main event. It feels great. Just having my hometown back me, Under Armour back me and Floyd Mayweather back me and now I’m on the undercard, it feels amazing….There’s a few names that they’ve [Mayweather Promotions] mentioned. And I believe that both of them will get knocked out. I believe that Floyd will play with him [McGregor] and then knock him out. 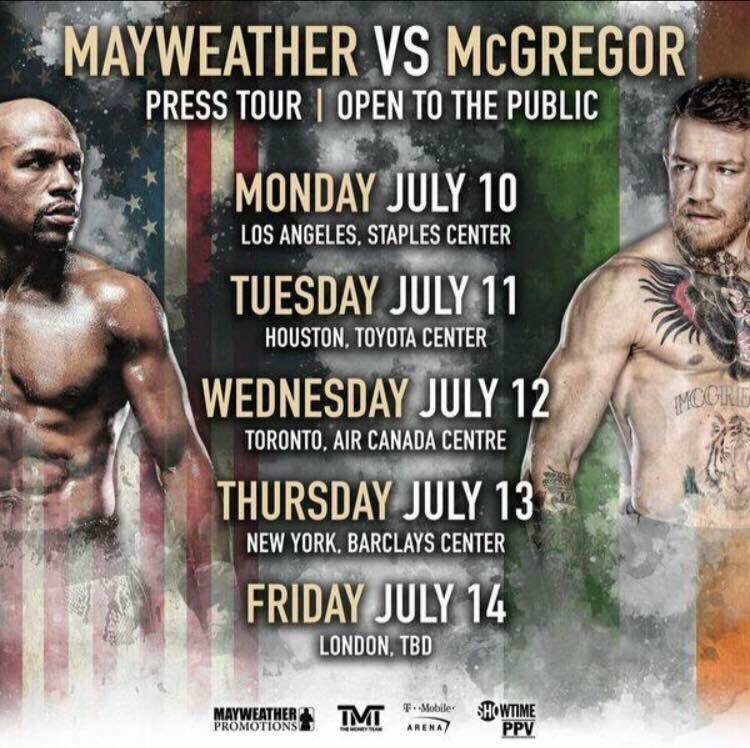 Tour dates and venues are announced for McGregor-Mayweather’s world promotion tour. The tour will appear in Los Angeles’ Staples Center on July 10; Houston’s Toyota Center on July 11; Toronto’s Air Canada Center on July 12; New York’s Barclays Center on July 13; and London, at a venue to be announced, on July 14. Woodley announces he will fight Maia at UFC 214 on July 29. Breaking news right here on UFC Tonight. Tyron Woodley will be taking on backpack, backpack rapido. You will not get the swipe from me. Swiper no swiping! Damian Maia and I will be showing down July 29th, in Anaheim, California. He’s coming for the belt and I ain’t giving it up easy…I will be very well prepared for this fight, and I’m excited, man. Conor McGregorDana WhiteFloyd Mayweather Jr.
White says the McGregor-Mayweather world media tour will only make one overseas stop, in London, and that a stop in Dublin will not be on the tour. According to reports, Mayweather wanted neutral locations for the world press tour and did not want to deal with the overwhelming crowd of supporters McGregor would get in his native Ireland. Brendan SchaubConor McGregorFloyd Mayweather Jr.
Schwab announces the tour dates and cities for McGregor-Mayweather Heavy Lies The Crown promotional tour. The fighters will appear in Phoenix 7/20, Salt Lake city 7/21, Toronto, Canada 7/27, Milwaukee 7/28, Chicago 7/29, and Detroit 7/30. McGregor will host an evening with fans at an event in Glasgow’s Armadillo venue on September 29. Tickets will be available for the event from www.sec.co.uk, ranging from £45.40 to £1,100. TMZ reports that the T-Mobile Arena in Las Vegas is already booked for the proposed date for the McGregor-Mayweather fight on August 26 by Ice Cube’s BIG 3 basketball league. BIG3 sources say they have no plans to move — they still have the venue booked and expect to play there on August 26th. McGregor-Mayweather sources say that BIG 3 will be moved to MGM Grand Garden Arena. Showtime releases the poster for the McGregor Mayweather fight. Mayweather confirms that he will fight McGregor in an Instagram post. The Mac Life announces that Mayweather has signed the contract to fight McGregor on August 26. McGregor confirms with a post to Twitter. I know I have a great opportunity and I will not waste it. He had wanted this from a long time ago. I’m very happy for this news they gave me. I know it will be very difficult, but I have the character to prevail. I tell all the Querétanos that I’m not going to let them down that I’m going to put soul, life, and heart and I will fight for what I most want, that’s why I’ll prevail. Mayweather has booked the MGM Grand in Las Vegas for August 26th, for a potential superfight with McGregor. Mayweather has fought at the venue for the final dozen bouts of his career. His promotional company have also reserved the arena on August 25 for a weigh-in. The as yet unannounced fight will be shown on Showtime, Mayweather’s long-time broadcaster of choice. Frampton confirms he will fight in Belfast on July 29th. The opponent has yet to be named but Frampton has already ruled out a fight against IBF champion Lee Selby. Frampton has previously said that Windsor Park would be his preferred venue but the Irish FA has confirmed that it is still in negotiations with the boxer over the use of the stadium. July 29th – keep it free. I can't wait to box @ home! Presser will be in the next week & tix will go on sale straight after #Homecoming ? Abner LloverasConor McGregorFloyd Mayweather Jr. The big news that I want to tell you is that the fight between McGregor and Mayweather has a date. It will be in September. A showtime executive says that while they would be willing to wait until next year if they had to, Mayweather and Showtime are targeting an early fall date for the proposed superfight. I think the date really is a function of how long it takes to get a deal done because the reality is, it took a long time for the UFC and Conor to reach an agreement to allow Conor to participate. Now the real negotiations start which is the Floyd side versus the Conor-UFC side. If that drags on then you’re probably looking at late this year. If it really drags on then you’re looking at early next year. But if people are as motivated as they seem to be – I know how badly Floyd wants it – if we get this wrapped up pretty quickly we could be seeing it early fall. That’s the goal. That’s what we’ve heard from Floyd. Now it’s just getting in a room and seeing if people will be reasonable on the kind of deal that they’re looking for. Delivering a promise made to his fans to fight in Ireland, Frampton says he will fight at Windsor Park on July 29th. No announcement of his opponent has been made. A third fight against Leo Santa Cruz seems unlikely, due to the Mexican’s unwillingness to travel. Lee Selby has also been rumoured, but his team say there has been no contact about a fight. Joshua’s promoter, Eddie Hearn, confirms that Joshua and Klitschko are likely to fight again before the end of the year. I believe Klitschko will go ahead with the rematch so we are looking at dates. The Principality Stadium is not really available in November because of rugby so 28 October is the option. Most of December is available but I don’t really want to go that late. Josh has a bit of a sore shoulder, Klitschko has had a tough fight, his face was bashed up. You have got two more weeks in May, all of June and after that they will be thinking ‘right let’s get back in camp’. Even if you started back in camp in August, then you have September and October so end of October can work. More than a year after their last fight was cancelled due to Jones’ one-year suspension for doping, Cormier will meet Jones to defend his light heavyweight belt at UFC 214 in Anaheim on July 29. Mansion Liverpool announces that McGregor will appear at the venue for a Grand National after party on Saturday 8th April. McGregor will host a St. Patrick’s Day party at Lavo, a club in New York on Friday 17 March. Reports surface that the T-Mobile Arena in Las Vegas has been provisionally booked for June 10th, for a potential McGregor-Mayweather fight. ▶BREAKING◀ I have confirmed there is a "hold" on @TMobileArena in Vegas June 10th for @FloydMayweather v @TheNotoriousMMA boxing match.